Draft: 2000, Montreal Expos, 4th rd. Clifton Phifer Lee… Married, wife's name is Kristen; one son, Jaxon (4/29/01) and one daughter, Maci (4/5/03)… 1997 graduate of Benton High School (AR), where he played baseball, basketball and football… Attended Meridian Community College (MS), 1998-99, and the University of Arkansas in 2000, where he went 4-3, 4.45 ERA… Had his number retired during the 2008-09 offseason by Benton High School and was honored with a Cliff Lee Day as well in Benton… Was CLE's 2005 Roberto Clemente Award nominee… He and his wife Kristen were honorary chairs for the Light the Night Walks held at Progressive Field, 2006-08, to raise funds for cancer research and patient services for the Leukemia & Lymphoma Society… Made a $1 million donation to Arkansas Children's Hospital to fund an endowed chair in pediatric hematology/oncology in honor of their son Jaxon, a children's leukemia survivor… In 2011, launched Lee's VIP's, a charitable ticket program benefitting Philadelphia-area children's groups and the Children's Hospital of Philadelphia (CHOP)… Supports the Leukemia & Lymphoma Society of Eastern PA… Member of the Mississippi Junior College Sports Hall of Fame… Signed by: Joe Jordan. Led the majors in BB/9.0 IP (1.19), SO/BB ratio (7.39) andpercentage of 1st-pitch strikes (71%); T-4th in the NL inSO (207), T-7th in innings (211.0) and 9th in ERA (3.16)...Made at least 30 starts for the 6th time in his career...Had his 2nd straight 200-SO season...Had 5 double-digit SO games, including a season-high12 SO twice: 6/5 vs LAD & 8/16 at MIL...Had 15 no-decisions in his 30 starts, T-1st among all MLBstarters (Mat Latos)...Posted a 2.45 ERA in 16 starts after the All-Star break,compared to a 3.98 ERA in 14 starts prior...The Phillies scored just 75 runs while he was in the game(211.0 IP), which was the 4th-lowest run supportaverage (3.20) among all MLB starters; the Phillies wereheld to 3 or fewer runs in 20 of his 30 starts (66.7%) ...Had the lowest win percentage in MLB (.400) among allpitchers with at least 20 starts and an ERA under 3.50;overall, the Phillies went 12-18 (.400) in his 30 starts...Issued 1 walk or none in 24 of his 30 starts (80.0%)...Pitched at least 6.0 innings and issued 1 walk or none ineach of his final 17 starts of the season, setting amodern-era ML record (since 1900); Christy Mathewson(1908) and Greg Maddux (1997) each made 14 straightstarts in which they went 6.0 or more innings andwalked 1 or none...Had the 5th-lowest ERA among all NL starters after theAll-Star break (2.45)...Threw a career-high 10.0 scoreless innings but receiveda no-decision, 4/18 at SF (Phillies lost, 1-0 in 11 inn. ); wasthe first Phillies pitcher to throw 10 shutout innings in agame since Hall of Famer Steve Carlton did it, 9/21/81 atMTL (ND, Phillies lost 1-0 in 17.0 inn. )...Was placed on the 15-day DL on 4/22 with a left obliquestrain (retroactive to 4/19)...Became the first Phillies pitcher to remain winless overhis first 9 starts of a season with an ERA of 3.00 or lower(4/7-6/5; 2.92 ERA, 21 ER, 64.2 IP) since the NL begankeeping track of earned runs in 1912...Earned his first win in his 14th start of the season, 7/4 atNYM; 279 different ML pitchers won a game before him...Became only the 2nd Cy Young Award winner in MLBhistory to begin a season without a win in 13 or morestarts; Vida Blue, who won the 1971 AL Cy Young Award,went 0-5 in 14 starts for KC in 1983...Was the first former Cy Young Award winner to have 13straight starts without a win since Greg Maddux went 0-5 over a span of 14 starts in 2008; the longest winlessstreak in ML history for a Cy Young winner was 19 starts(Fernando Valenzuela, 1988-89). First full season in the NL. ... Selected to the NL All-Star team via the player vote. ... Finished 3rd in NL Cy Young Award balloting with 90 total points (five second-place votes, 17 third-place votes, nine fourth-place votes and 1 fifth-place vote). ... Led the majors with 6 shutouts, the most by a Phillie in a single season since Steve Carlton also had six in 1982. ... Finished 2nd among all NL starters in CG (6), SO (238), SO/BB ratio (5.67) and BB/9.0 IP (1.62), T-2nd in quality starts (25), third in ERA (2.40), fourth in innings (232.2) & SO/9.0 IP (9.21), T-4th in wins (17), sixth in opponent's average (.229), 7th in winning % (.680). ... Had the 3rd-lowest home ERA in the NL (1.94). ... Set a career high with 238 SO, the most by a Phillies LHP since Steve Carlton struck out a ML-leading 275 in 1983;became the 12th pitcher in Phillies history (4th LHP) to reach 200 SO in a single season. ... Set a career high in innings (232.2). ... His 17 wins were the most for a Phillies LHP since ShaneRawley in 1987 (17-11). ... Named NL Pitcher of the Month for August (5-0, 0.45 ERA, 2 ER, 39.2 IP) and June (5-0, 0.21 ERA, 1 ER, 42.0 IP);was 1st Phillies pitcher to win award twice in one season. ... Became the 1st pitcher in ML history to have two months in one season with at least five wins, no losses and an ERA under 0.50. ... Had nine double-digit SO games, the most by a Phillie in a single season since Curt Schilling had 15 in 1998. ... Went 13-3, 1.59 ERA (27 ER, 152.2 IP) in his final 20 starts. ... Had a career-high 34.0-inning scoreless streak, 6/11-7/3, the second-longest streak in Phillies history (Grover Alexander - 41.0 IP in 1911); also had a 30.2-inning scoreless streak, 8/17-9/10. ... Became the third pitcher in club history to pitched three straight SHO, 6/16-28 (last: Roberts, 1950). ... Had a 29.0-inning scoreless streak at Citizens Bank Park, 8/17-9/15, the 2nd-longest home streak in MLB in 2011. ... Had a season-long 7-game win streak, 7/30-9/5 (9 GS,7-0, 1.00 ERA, 8 ER, 72.1 IP). ... Hit his 1st two career HR: 7/9 vs ATL (Tommy Hanson) and 8/9 at LAD (Ted Lilly); T-1st among all ML pitchers. ... Set a career high with 16 SO, 5/6 vs ATL; T-3rd for a single game in club history. ... Got his first career SB, 5/21 vs TEX. ... Won six consecutive home starts while posting a 0.92 ERA(5 ER, 49.0 IP), 5/21-6/28. ... Had a career-high 3 RBI, 5/26 vs CIN. ... Became the 1st pitcher to strike out at least 12 batters in a CG while throwing less than 100 pitches (12 SO, 99pitches) since Sandy Koufax on 6/4/64 at PHI (no-hitter, 12 SO, 97 pitches), 4/14 vs WSH. ... Presented with the Steve Carlton Pitcher of the Year Award by the Philadelphia chapter of the BBWAA. Clifton Phifer Lee...married, wife's name is Kristen; one son, Jaxon (4/29/01)and one daughter, Maci (4/5/03)...attended Meridian Community College (MS), 1998-99, and the University of Arkansas in 2000...had his number retired during the 2008-09 off-season by Benton High School and was honored with a Cliff Lee Day as wellin Benton...2005 John Hancock Roberto Clemente Award nominee for Cleveland...hasbeen involved in several charities during his playing career, including serving as honorarychairs for the Light the Night Walks held at Progressive Field, 2006-08, to raise fundsfor cancer research and patient services for The Leukemia & Lymphoma Society...son, Jaxon, is a children's leukemia survivor...the Lees routinely donate their time andmoney to the The Leukemia & LymphomaSociety...member of the Mississippi JuniorCollege Sports Hall of Fame. Posted one of the most historic seasons in the history of the American League and one of the best ever turnedin by a left-handed pitcher in the club history...Led the AL in wins (22) and ERA (2.54) to become the firstIndians pitcher since 1972 to lead the league in wins (G Perry 24) and the first to win 20-game since Perryin 1974...His .880 winning % (22-3) was the 2nd best in Indians franchise history (1901-2008) and tied for3rd highest in MLB history (1876-2008) by a 20-game winner...First Indians LHP to lead the AL in ERA sinceSame McDowell in 1965 (2.18)...Lowest ERA by an AL LHP in this decade...His 22 wins are the 2nd most inclub history by a LHP (Vean Gregg 23 in 1911)...One of just 7 pitchers since 1920 (STATS LLC) to win 22 ofhis first 25 decisions...Captured 2008 AL Cy Young (last AL team with consecutive Cy Young winners wasToronto in 1996-97)...In addition to leading the league in wins, ERA andwinning %, he also finished 2nd in CG (4), 9th in K (170), 2nd in IP(223.1), 13th in avg all'd (.253), 3rd in slg% all'd (.348), 3rd in on-base% (.285) allowed, 1st in HR all'd/9.0IP (.48, 12HR, 223.1IP), 2nd inbaserunners/9.0IP (10.2) & 3rd in SO/BB ratio (5.0)...His 1.37 walksper 9.0IP were lowest in the AL...Was 5th in the league in runs support(6.13), 9th in pitches thrown (3289) and 13th in ground ball/fly ballratio (1.38) ...Induced 27 GIDPs (T5th in AL)...Tossed the first CG/shutout of his career in start of April 24 at KC(9.0IP, 3H, 0R, 0BB, career-high tying 9K)...Did not allowed a run inMajor League/career-high 27.0IP from April 13-30, longest by an Indianspitcher since Dan SPILLNER in 1982 (29.1IP)... Became the 1st 13 gamewinner in the AL as he tossed his 2nd CG of the year (9.0IP, 11H, 2R/ER,0BB, 4K) on July 20th, a 6-2 win over the Mariners in Safeco Field...Became the 1st 20-game winner in the majors in his start on Sept. 1,vs. the Chicago White Sox as he tossed his 4th complete game and2nd shutout of the season as he allowed just five hits... He retired 21straight batters from the 3rd batter of the 1st inning to the 2nd batterin the 8th inning...Lee is the 25th pitcher in Indians history to record 20 or more wins in a season and the 56thtime an Indian has done so...Won a career-high 11 straight decisions from July 11-Sept. 12, the longest in MLB since 2005 (Chris Carpenter13G) & longest by an Indian since Gaylord Perry 15 in 1974...Posted 11th win and fanned a career-high 11 battersin his start of June 26 vs. San Francisco (8.0IP, 4H, 1R/ER, 11K)... Entered the All-Star break at 12-2 w/a2.31 ERA in 18 starts and started for the American League team in his 1st career All-Star appearance (2.0IP,1H, 0R, 0BB, 3K)...Only Cleveland LHP ever to start an All-Star Game... Won AL pitcher of the Month in April(5-0, 0.96ERA)... ... Went 5-0 w/a 1.86 ERA in 5 August starts (38.2IP, 36H, 8ER) to earn AL PITCHER ofthe MONTH... First Indians pitcher since CHARLES NAGY (1996) to win two AL Pitcher of the Month Awardswithin the same season...Went 5-0 in 5GS vs. KC this season...The last Cleveland pitcher to go 5-0 in five starts versus one team inone season was Pat Dobson in 1976 against the Orioles...Became only pitcher since 1956 to go at least 8.0IPin 3 consecutive starts (April 13-24) with less than 3 hits/1 walk allowed while striking out at least 8 batters (retrosheet/baseball-reference.com)...Won his first 6 startsand was the first Indians pitcher since GREG SWINDELL in1988 to do so...From June 9th-on he went 13-2 w/a 2.59 ERAin his last 20 starts (146.1IP, 146H, 42ER) and from July 11thon he was 11-1 w/a 2.67 ERA over his last 14 starts (104.2IP,110H, 31ER)... Earned his 21st victory on Sept. 7 @ KC(7.1IP, 7H, 1ER)... Win #22 on 9/12 vs. KC ...According toELIAS Lee was just the 4th pitcher in ML history to win 22 ofhis first 24 decisions... Went 10-0 at home, the first pitchersince JOHAN SANTANA (12-0 in 2006) to go w/o a loss in 10+decisions at home...Was 16-1 at night... His 29GS to earn 22wins equaled fastest in club history (4th time, last Bob Fellerin 1951)...Went at least 5.0IP in all 31 of his starts...Went atleast 8.0IP twelve times... He was 3-0 in June w/a 3.41 ERA in 5 starts (31.2IP, 33H, 12ER)... Went 3-1 w/a3.14 ERA (43.0IP, 44H, 14ER) in 5 July starts as he became MLB's first 14-game winner and struck out 10batters in start of July 25 vs. Minnesota (8.0IP, 6H, 2R/ER, 0BB, 10K)... ...Did not make his last scheduledstart of the season on Sept. 28 at CWS (stiff neck)...Won his first start of the year in Oakland on April 6, a 2-1 win over the A's and Joe Blanton...6.2IP, 4H, 1R/0ER,1BB, 4K...Was his first win since July 1, 2007 vTB (4GS/8G w/o win)... Went 9.0 scoreless innings in his 7thstart vs. Toronto on May 12 (G2) to lower his ERA from 0.81 to 0.67, but did not get a decision as the Indiansfailed to score during his time on the mound (Indians lost in 10.0IP, 0-3)...s 35.0IP shy of having the top winning % in Club History (Colon .625, Lee .661)... Had an ERA of 1.16 in thefirst inning (31.0IP, 27H, 4ER)...Batters hit .265 (88-332) with runners on and .273 (45-155) with RISP...Hadonly 3 at bats w/the bases loaded this year...3SB/0CS... Did not walk a batter over 28.0 innings from April 18to May 7... Allowed an OPS of .633 for the season (.621 by RHH, .661 by LHH). Got hurt in spring training and never got his season on track, spending 5 weeks in Buffalo at the end of July andall of August before returning to relief duty in September. ..DL-Spent the first month of the season on the 15-dayDL w/a strained right abdominal muscle ...Was injured during a bullpen session in February and did not make aspring start ...Was placed on the 15-day DL on April 1... Made 3 rehab starts with minor league affiliates plusone at extended spring training in Winter Haven... Threw 5.0 shutout frames for Akron vs. Reading to win hisfinal rehab start (2H, 1BB, 7K) ACTIVE- Received no decision in his 2007 debut May 3 vs. Toronto, a 6-5Indians win (6.0IP, 9H, 5R/ER) Recorded the 50th win of his career in start on May 8 against the LA Angels ashe tossed his 3rd career CG in a 5-1 win over the Angels (season-high 9.0IP, 3H, 1R/ER, 2BB, 2K)...lmprovedto 2-0 on the year and 8-0 career in interleague play w/a win over the Reds (6.0IP, 6H, 4R/2ER) on May 18...0nMay 23 at Kansas City, matched a career high with 8R/ER allowed as he suffered his 1st loss ... Faced theTigers on June 2, lost his 3rd straight start (4.1IP, 8H, 5R)... Surrendered 3HR in the Indians 4-2 loss atCincinnati on June 8, tallying 6.0IP, 4H, 4R/ER, 3BB, 3K in his 4th straight loss ... Posted his 3rd win and haltedhis personal4-game losing streak in outing, June 13 at Florida (5.0IP, 6H, 3R/ER, 4BB, and a season-high 6K)1R/ER, OBB, 5K, HR to Howard... Cut down Tampa Bay 3-2 on July 1, totaling 8.0IP, 4H, 1R/ER, 2BB, 9K as hewon his 3rd straight decision (June 13-July 1, going 3-0 w/a 2.77ERA in 4GS, .26.0IP, 21H, 8ER)...Proceeded togo 0-4 w/an 11.70 ERA over his next 4 starts (20.0IP, 32H, 26ER) from July 6-26 and was optioned to AAABuffalo on July 27...Allowed 7ER in 3 straight starts, July 16-26... From May 23-July 26 went 3-8 w/a 7.40 ERAin 12 starts (65.2IP, 81H, 54ER) ... BUFFALO- -Despite allowing 3 or fewer runs in 6 of his 7 Bisons starts, theteam was just 1-6 when Cliff took the hill. ..Lone victory came on 8/25 vs. ScrantonlWilkes-Barre (6.0IP, 5H, R,ER, 3BB, 8K)... -Struck out 8 in three of seven games (7/31 in Syracuse, 815 in ScrantonlWilkes-Barre, 8/25 vs.SWB) ... Struck out 50 in 41.01P and held opponents to a .206 batting average ...SEPT- Went 0-0 w/a 4.76 ERA in 4 September reliefoutings, the first of his big league career (5.2IP, 7H, 3R/ER) ... Did not allow a run over his last 2 outings (3.2IP, 1H, OR, 3K)... STATSBattershit .292 (33-113) w/RISP and .303 (53-175) with men on base ...Went 3-1 w/a 3.38 ERA over 4 interleague starts this year toimprove to 10-1 lifetime in interleague contests... His .909 win% is the best in the history of interleague play (min. 10GS). Enjoyed a breakout season, posting a career-high 18 wins - the most by an Indians LHP since Greg Swindell's 18 in 1988 and the most overall by an Indian since Bartolo Colon (18-5) in 1999...His 4th place finish in the AL Cy Young voting (8 pts) was the highest since Colon in 1999 by an Indian...His .783 winning % (18-5) led the American League, the first Indian since Bob Feller in 1951 to lead the AL inwinning %...The .783 winning % was tied for the 3rd best mark in club history with Colon behind Johnny Allen in 1937 (15-1) and Bob Feller (.813) in 1954...Finished T2nd in the AL in wins, the most by a LHP in the AL in 2005...His .251 average against ranked 11th in the AL as he topped 200.0IP for the first time...Won a career-high 9 straight decisions from July 18-Sept. 22 to start the 2nd half and over the streak posted an ERA of 3.90 in 13GS w/o a loss (85.1IP, 79H, 37ER)...Equaled the longest in the AL in 2005 and was the longestby an Indians starter since Dennis Martinez in 1995 (Steve Karsay won 10 straight in 1999 in relief )...Over all in the 2nd half he was 9-1 w/a 3.66 ERA in 14 starts (93.1IP, 85H, 38ER, T4th in the AL in wins in 2ndhalf)...Over his last 9GS from August 14 on he was 6-1 w/a 2.73 ERA (62.2IP, 48H, 19ER) and worked at least 6.0IPin all 9 starts...His winning % of .711 (32-13) is 2nd best among AL pitchers over the last two seasons (2004-05)behind LHP Johan Santana (35-13)...Had the 3rd best run support in the AL (6.2RS/GS) behind David Wells andChan Ho Park...Made his 2005 debut in Chicago on April 7 and was tagged for 8 hits and 5 runs over 3.1IP, his shortest outingof the season (ND)...Won his first game of 2005 on April 18 at Kansas City, tossing 7.0 shutout innings while allowingjust 2 hits and did not allow a runner to 3rd base (2BB, 5K)...Tossed another 7.0 shutout innings in his 4thstart to win his second straight outing (7.0IP, 4H, 0R) at Seattle on April 23, extending his scoreless streak to anIndian season-high 14.0IP...Suffered his 1st loss of the 2005 season on April 30, a 8-1 Tribe loss to KC (5.0IP, 8H,6R/5ER)...Did not allow a run in 16.0 IP from April 18-April 30 (Indians season-high, tied w/ Sabathia)...Was outstanding in outing of June 7 against the San Diego Padres in Petco Park...Did not get a decision despitepitching 7.0 shutout innings in a game that was decided in the 11th inning after a Khalil Greene error (2-0 win)...7.0IP,5H, 0R, 2BB, career-high 9K...During the month of June he was 2-1 w/a 2.96 ERA in 6 starts (36.1IP, 40H, 16ER,14BB, 33K)...Earned his 10th win in his start of July 18 against the Kansas City Royals at Jacobs Field (6-2 win)...First career complete game in a rain-shortened 5-inning affair...5.0IP, 4H, 2R/2ER, 2BB, 7K, HR (DeJesus)...Pitched 8.0 shutoutIP in his 15th win September 6 at Detroit ...4H, 0R, 2BB, 4K...Picked up his 16th win in his outing of Sept. 11 vs.Minnesota...6.0IP, 4H, 2R/ER, BB, 2K, HR (Jones)... Went a season-high tying 8.0IP (3rd time) in last start of Sept.28 vs. Tampa Bay in a 1-0 loss to Seth McClung that snapped his 9-game winning streak...Worked 5.0 or more IP in last 31GS of the season after season-low 3.1IP to start the season... Worked into the 6thinning in 26 of 32 starts...Batters hit .264 (85-322) off him w/runners on and .235 (39-166) w/RISP and .211 (16-76)with RISP-2outs...Batters hit .241 (109-452) off him w/no one on...Allowed 3 grand slams...His 10.96 (246/202.0IP)baserunners allowed per 9.0IP was 8th in the AL, his .295 on-base % allowed was 6th, his .237 average against vs.RHP was 13th and his fly ball ratio of .56 (287GB, 510FB) was 3rd in the league...Indians were 23-9 (.719) whenhe started...Had surgery after the season (10/26) in Philadelphia, PA to repair a right-sided incisional hernia (Dr.Bill Meyers performed the arthroscopic procedure). Lee put together a impressive campaign, leading the team with 161 strikeouts and tying Jake Westbrook for ateam-best 14 wins, which were tied for 8th in the entire American League in his first full season in the majorleagues...Was 5th in the league with 8.1 strikeouts per 9.0IP, just head of Boston's Curt Schilling as his 161SOranked 11th among AL pitchers...Was also T8th in the league in winning % at .636 (14-8).Started the year 5-0 as only three Indians pitchers in the last 30 years have now started a season 5-0 (Lee,D.Martinez 9-0 in 1995, Swindell 6-0 in 1988)...Allowed 3 or fewer runs in each of his first 8 starts, joining BudBlack in 1990 as the only Tribe pitchers in the last 30 years to do so...Started the year by winning 10 of his first11 decisions (last Tribe pitcher to start 10-1 was Steve Karsay in 1999)...The last Indians starting pitcher to start10-1 or better was Charles Nagy in 1996 (11-1). Picked up his fist win of the season in the Tribe's home opener, 6-3 victory vs. Minnesota on April 12 (6.0IP, 5H,2R/ER, 4BB, 1K)...Won his second straight start on April 18 vs. Detroit (5.1IP, 6H, 3R/ER, 0BB, season-high 6K)to equal a career-high winning streak...Won his 3rd straight decision in start of April 30 vs. Baltimore in tossingthen season-high 7.0 innings (7.0IP, 5H, 1R/ER, 4BB, 5K)...Won 4th straight decision in start of May 12 atBoston (6.0IP, 6H, 2R/ER, 3BB, 8K), setting a new career single-game standard for strikeouts...Won his careerhighand 5th straight decision to open the season in start of May 17 vs. Chicago-AL (5.0IP, 2H, 1R/ER, 3BB, 3K).Worked a season-high 7.2IP in start at Tampa Bay on May 23 (ND, 7.2IP, 6H, 4R/ER)...Equaled career-high with8 strikeouts on May 28 vs. Oakland, shutting out the A's over 6.1IP, but got a no-decision in a 1-0 win...Allowed aseason-high 5 runs and 10 hits as he suffered his 1st loss of the season on June 3 at Anaheim (6.1 IP, 10 H,5R/ER, 1SO, 1HR)...Also won five straight decisions to equal season/career-high, June 18-July 16.Was ejected by HP Umpire Matt Hollowell from start of June 13 vs. Cincinnati (3.2IP, 6H, 7R/ER, 5BB, 4K, 2HR)after throwing behind Ken Griffey, Jr. in the 4th inning...Did not get a decision in the 10-8 Tribe win after beingtossed w/a 7-1 deficit and was later suspended for 6 games by MLB's Bob Watson on June 19 (He appealed andelected to drop the appeal on June 24 and served the suspension, 6/24-30).Recorded his 6th win in 7 decisions in his start at Atlanta on June 18, a 4-2 win over Mike Hampton (7.0IP, 6H,2R/ER, 0BB, 7K)...He also won his next start on June 23 at Chicago, improving to 7-1 in the Tribe's 9-5 victory6.0IP, 5H, 3R/ER, 3BB, 6SO, 2HR)...Upped his major league best winning % to .900 (9-1) by winning his startvs. Oakland on July 11 (7.0IP, 6H, 1R/ER, 3BB, 5K), the most wins before the break for a Tribe pitcher since BartoloColon in 2002...Matched his season/career-long winning streak by winning his 5th straight decision/10th winoverall in start of July 16 at Seattle (6.0IP, 4H, 3R/ER, 6K)...He won 3 straight starts, July 6-16, and 5 of 6 startsoverall from June 18 - July 16 (6GS, 5-0, 3.58ERA, 37.2IP, 31H, 15ER, 34K).The 5-game winning streak was snapped in start of July 21 vs. Chicago-AL as he fell to 10-2 on the year (4.0IP,9H, 7R/ER, 2HR to Carlos Lee)...Worked a career-low 0.2IP in his 21st GS on July 26th vs. Detroit as he fell to10-3 in his first losing streak of the year (0.2IP, 6H, 6R/ER, 40P)...Lost for then career worst 3rd straight startin outing of August 2 @TOR (4.1IP, 8H, 6R/2ER)...Allowed a career-high 8 runs in start of August 17 @TEX (3.1IP, 7H, 8R/ER) while losing his 4th consecutive decision.Lost team-high 6th straight decision in his start at New York on Sept. 2 at New York (1.2IP, 5H, 6R/ER, 3-run HRto A-Rod)...The 2004 team and personal-high 6-game losing streak was snapped in start of Sept. 8 at Seattle5.0IP, 5H, 4R/ER, 3BB, 6K, 3HR) as 2 of his 5 second half wins came against Seattle in Safeco Field (went 9GSw/o a win from 7/21-9/2)...Over the 9 starts he was 0-6 w/a 10.51 ERA (37.2IP, 59H, 48R/44ER) to raise his seasonERA total from 3.81 to 5.48.Won his career-best 12th game in start vs. Minnesota on Sept. 23 (5.2IP, 8H, 5ER, 7K) before notching 2ndstraight win and 13th on the season on Sept. 28 at KC (6.1IP, 3H, 1R, 6K), his then longest start of the secondhalf ...Won his last 3 starts on the year, including his 14th and final win of the year in start of Oct. 3 at Minnesota7.0IP, 5H, 2R/ER, 0BB, 6K, 0 AB's w/RISP)...Over his last 3 starts he was 3-0 w/a 3.79 ERA (19.0IP, 16H, 8ER,4BB, 19K)... Over his last 5 starts after 1.2IP outing at New York he was 4-1 w/a 5.14 ERA (28.0IP, 25H, 16ER)& fanned 31 batters in 28.0IP (10.0K/9.0IP)...Over his last 13 starts he was 4-7 w/a 8.27 ERA (65.1IP, 84H,60ER)...ERA after June 1 was 6.71 (119.1IP, 138H, 89ER).Batters hit .315 (47-149) off him w/RISP, .269 (18-67) with RISP-2outs, and .273 (81-297) w/runners on...WasT7th in walks allowed (81)...ERA in the 1st inning was 7.16 (32.2IP, 44H, 30R/26ER, .324 average against)...Allowed9 steals to 5CS against...Batters were 2 for 12 (.167) off him with the bases loaded... Average vs. LHP (.231) was17th best among AL pitchers...Was 3-0 vs. the Twins. Lee put together a solid season after spending the first two months of the season on the disabled list with alower abdominal strain and a sports hernia...Originally felt discomfort in the region during the minor league winterdevelopment program in the off-season and was placed on the 60-day DL on 3/29 after being limited to just 1 bullpensession in spring training (had surgery following the season)...He spent most of April and May in extended springbefore making a rehab start at A Kinston on 5/29 (4.1IP, 0H, 1R/0ER, 3BB, 4K)...He was activated from the 60-dayDL on 5/30 and optioned to AA Akron...He split June between Akron and AAA Buffalo, going 3-0 w/a 1.93 ERA(28.0IP, 22H, 6ER, 14BB, 28K) in 5 starts before being recalled on 6/29 for a spot start and his 2003 major leaguedebut on 6/30 at Kansas City in G1 of a DH...In that game (G1) of 6/30 at KC he picked up his 1st major league winin the 10-5 win (6.0IP, 3H, 2R/0ER, 3BB, 5K)...Was optioned back to AAA Buffalo after the win and made 8 moreAAA starts before returning to Cleveland in mid-August...Began his second stint with the Tribe after being recalledon 8/16...Improved to 2-1 with his finest start as a big leaguer on 8/22 in St. Pete against Tampa Bay, workingcareer-high 8.0IP with career/season-best 7K (later equaled three more times)...After his return in August he went2-3 w/a 4.08 ERA in 8 starts (46.1IP, 38H, 21ER) and worked into the 6th inning in 6 of those starts...Had surgeryto repair the hernia on 10/8 by Dr. Bill Meyers in Philadelphia, PA.
Split the season between the Montreal and Cleveland organizations, winning 12 games in the minor leaguesbefore making 2 impressive starts in September with the Indians...Spent the first three months of the 2002 seasonat AA Harrisburg, where he was 7-2 w/a 3.23 ERA (86.1 IP, 61 H, 31 R/ER, 23 BB, 105 SO, 12 HR) in 15 starts beforebeing acquired along with three others in exchange for Bartolo Colon...Won 4 straight decisions from 4/19-5/10and did not receive his first loss of the year at Harrisburg until 5/21...Thru the end of May he was 6-1 w/a 2.39ERA over his first 11 starts (64.0 IP, 42 H, 17 ER, 79 SO)...Struck out a season-high 12 on 5/21 vs. Trenton in hisfirst loss of the season (6.0 IP, 4 H, 2 R/ER, 1 BB, 12 SO)...He was named the Expos Minor League Player of theMonth for the month of May (4-1, 2.11 ERA, 6 GS)...During his tenure at Harrisburg he was selected to appear inthe Double A All-Star Game as his 105 SO were 1st in the Eastern League and his 3.23 ERA ranked 7th at the timeof the trade...Was assigned to Akron (Harrisburg was in Akron at the time of the trade) and made his Akron debuton 7/1 vs. Bowie (W, 5.0 IP, 1 H, 4 R/3 ER, 5 BB, 4 K)...Made 2 additional starts in Akron before being promoted toAAA Buffalo on 7/18...Was leading Eastern League in strikeouts at time of his promotion to AAA Buffalo andallowed only 11 hits and struck out 18 in 16.2 innings with the Aeros...Combined on the year at Double A withHarrisburg and Akron he went 9-3 w/a 3.58 ERA in 18 starts (103.0 IP, 72 H, 41 ER, 33 BB, 123 SO)...Did not winover any of his last 5 regular season starts and 1 playoff start at Buffalo, striking out 11 in a no-decision vs.Scranton (6.0 IP, 6 H, 3 ER)...Went 0-2 in August for Buffalo w/a 5.40 ERA (23.1 IP, 21 H, 14 ER)...On the year minorleague hitters hit a combined .205 (108-528) off him...RH minor league hitters hit .218 (95-436, 17 HR) and leftieshit .141 (13-92, 3 HR)...Contract was purchased from AAA Buffalo on 9/13 after the conclusion of the InternationalLeague playoffs and made his major league debut on 9/15 vs. Minnesota...Fell to 0-1 in the 5-0 Twins victorydespite allowing only 2 hits and 1 run over 5.1 IP...Made his 2nd and final start on 9/21 at Kansas City, allowingjust 1 run and 4 hits over 5.0 innings of work in a no-decision...After the season he was named the fifth bestprospect in the Indians organization by Baseball America. Spent his first full professional season in 2001 at Jupiter of the Florida State League, yielding only 78 hitsin 109.2 IP while fanning a 129 batters, the 3rd highest total in the FSL...His 10.53 SO/9.0 IP led all league startersand his .213 average against as a starter was the 5th lowest mark among FSL starters...Was also 5th w/11.24runners allowed per 9.0 IP and 13 HR allowed...Tossed 8.0 innings with no-hits allowed on 8/4 vs. St. Lucie (1 BB,10 SO) after a rehabbing pitcher started the game...Had two other starts with 10 strikeouts. Was selected out of the University of Arkansas by the Montreal Expos in the 4th round of the 2000 draft andmade 11 starts that year for Cape Fear of the South Atlantic League where he was a teammate of Brandon Phillips. 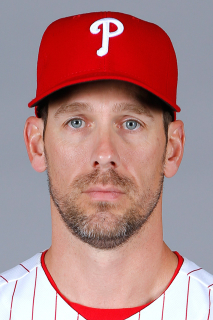 November 2, 2015 LHP Cliff Lee elected free agency. November 2, 2015 Philadelphia Phillies activated LHP Cliff Lee from the 60-day disabled list. October 24, 2014 Philadelphia Phillies activated LHP Cliff Lee from the 60-day disabled list. September 2, 2014 Philadelphia Phillies transferred LHP Cliff Lee from the 15-day disabled list to the 60-day disabled list. Left flexor pronator strain. August 1, 2014 Philadelphia Phillies placed LHP Cliff Lee on the 15-day disabled list. Left flexor pronator strain. July 21, 2014 Philadelphia Phillies activated LHP Cliff Lee from the 60-day disabled list. July 11, 2014 Philadelphia Phillies transferred LHP Cliff Lee from the 15-day disabled list to the 60-day disabled list. Grade 1/2 left elbow strain. July 6, 2014 Philadelphia Phillies sent LHP Cliff Lee on a rehab assignment to Clearwater Threshers. May 21, 2014 Philadelphia Phillies placed LHP Cliff Lee on the 15-day disabled list retroactive to May 19, 2014. Grade 1/2 left elbow strain. May 9, 2012 Philadelphia Phillies activated LHP Cliff Lee from the 15-day disabled list. April 21, 2012 Philadelphia Phillies placed LHP Cliff Lee on the 15-day disabled list retroactive to April 19, 2012. Left oblique strain. December 15, 2010 Philadelphia Phillies signed free agent LHP Cliff Lee. November 7, 2010 LHP Cliff Lee elected free agency. July 10, 2010 Texas Rangers activated LHP Cliff Lee. July 9, 2010 Seattle Mariners traded LHP Cliff Lee and RHP Mark Lowe to Texas Rangers for RHP Blake Beavan, RHP Josh Lueke, 1B Justin Smoak and 2B Matt Lawson. April 30, 2010 Cliff Lee roster status changed by Seattle Mariners. April 25, 2010 sent LHP Cliff Lee on a rehab assignment to Tacoma Rainiers. April 4, 2010 Seattle Mariners placed LHP Cliff Lee on the 15-day disabled list retroactive to March 26, 2010. Abdominal strain. December 16, 2009 Philadelphia Phillies Traded LHP Cliff Lee to Seattle Mariners; West Tenn Diamond Jaxx Traded RHP Phillippe Aumont to Reading Phillies; Seattle Mariners Traded RHP J.C. Ramirez to Philadelphia Phillies and High Desert Mavericks Traded CF Tyson Gillies to Clearwater Threshers. July 30, 2009 Cliff Lee roster status changed by Philadelphia Phillies. July 29, 2009 Cleveland Indians traded LHP Cliff Lee to Philadelphia Phillies.